When it comes to sun protection for sensitive skins, we think we’ve got it covered! Techniblock is a powerful, modern formula that offers advanced protection against harmful UV rays whilst allowing the skin to breathe. It’s a light, transparent spray that goes on quickly and easily, doesn’t have to be rubbed in, and lasts for several hours. Traditional sun creams and lotions use emulsifiers to carry the UV filters that protect from sunburn; however Techniblock is completely free of oils and emulsifiers. UV protection is delivered in a cooling, CFC-free ethanol-based aerosol spray that evaporates almost instantly on the skin, leaving behind just what’s needed to keep you protected in the sun. The absence of emulsifiers means that Techniblock will not block pores or irritate even the most sensitive skin, which helps to prevent heat rash and prickly heat. It all makes Techniblock extremely water-resistant, because oils and emulsifiers break down in water, therefore, prolonged swimming or water sports will make traditional sunscreens less effective whereas Techniblock will keep on protecting your skin, whether you’re in or on the water. So, what’s not to love about a clear, non-greasy, oil and fragrance-free sun protection that’s really quick to apply and doesn’t need constantly topping-up? Forget sticky, gooey creams and lotions that leave your hands greasy, Techniblock is the sun protection for people who hate the hassle and mess of using a sunscreen but know that it’s important to protect skin adequately when enjoying the sunshine. Aside from the very real and dangerous threat of skin cancer, something that now poses a higher risk to people in the UK than lung cancer, who wants to have their holiday spoiled by sunburn? It’s painful, can make you feel very ill and often completely ruins the break that you’ve looked forward to for so long! 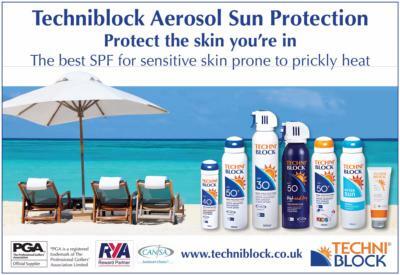 Be sun smart this year and protect the skin you’re in with Techniblock sunscreen.